After many years in Los Angeles, filmmaker Danny Miller moved to Pahala on the Big Island and quickly found his passion in residents' dedication to nearby Punaluu. "Families who had been there for generations wanted to get the word out," says Miller. "They wanted to show the larger community how unique and beautiful Punaluu is and why it's been such an important part of the lives of the people who live there." A three-year labor of love that Miller calls "mostly a volunteer effort" ensued. The result is a 28-minute DVD called "The Punaluu Experience." 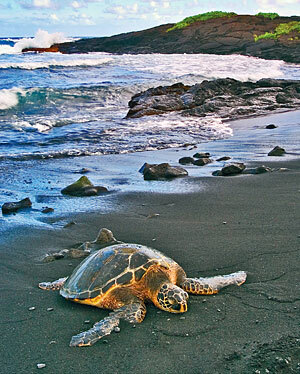 It explores the world of the honu, or Hawaiian green sea turtle, and the fishing grounds and heiau of the area. Miller also incorporated interviews with longtime residents and kupuna who share stories about what the magical stretch of beach means to them. Marine biologists George Balazs and Jason Turner provide a different perspective about the "living classroom and laboratory." One look at the exceptional cinematography and footage of sea turtles hatching sets this documentary apart. And one look at Miller's credentials explains why. Originally from Florida, the 44-year-old completed film school in Los Angeles before embarking on a documentary about the history of Catalina Island, a place that lost most of its heritage. That's why Miller, who says he's "always had kind of a thing for islands," was so impressed to find the indigenous culture in Hawaii "very much alive and growing." In Los Angeles he spent years making documentary films for the Nature Conservancy and National Audubon Society. He also produced behind-the-scenes segments, promotional trailers and DVDs for studios such as Universal, DreamWorks, Columbia, Castle Rock, Disney, Imax and MGM. A remote plantation cottage in need of renovation proved the perfect respite from the hectic pace of Los Angeles, but eventually the part-time escape became his full-time home. It wasn't just the elders who inspired Miller to begin this project. Students told him of camping and fishing on this land every summer to learn its history, culture and customs. "Their lives have been changed by that place, and it's really amazing," he says. Keolalani Hanoa started the free children's program and was a vocal advocate for Punaluu. But she died in 2006 before Miller completed the documentary. He says her death was a "great loss that really inspired us to follow her vision." Several others volunteered to finish "The Punaluu Experience." Composer Demetrios Oliveira, born and raised near Punaluu, donated a score for the film, as did Academy Award-winning composer James Horner, who allowed Miller to use selections from the soundtrack of "A Beautiful Mind." The Hawaii Community Foundation funded the film and made it possible to distribute it to Hawaii public libraries and public schools. In the end, everyone seemed to unite behind one purpose. And that, according to Miller, is "to protect this sacred place." ....of the black sand beach on the Big Island's Kau coast. To order "The Punaluu Experience," visit www.kaupreservation.org or call 928-8144. A $25 donation (includes shipping) benefits the nonprofit group Kau Preservation, which works to protect the Kau coastline.